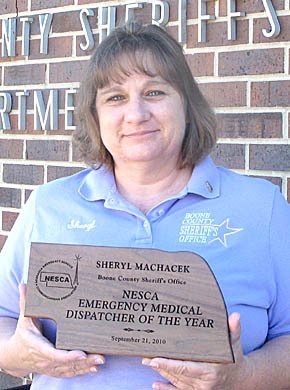 Sheryl Machacek, E911 communications director with the Boone County Sheriff’s Department, received a statewide award on Sept. 21 from the Nebraska Emergency Services Communications Association (NESCA). The award was for her actions during a 911 emergency call in September, 2009, where Machacek talked a local woman through the steps of CPR so she could assist her husband, who was having a heart attack. The husband survived the very serious medical emergency and is now back to normal function. Other Boone County Sheriff’s Department employees honored at the NESCA Conference for their years of service to the Sheriff’s Department were Nina Johnson, dispatcher-jailer, 20 years, and Carolyn Beckmn, dispatcher-jailer, 10 years. Donna Johnson, office supervisor and dispatcher-jailer, has been with the department 30 years. More details in the Sept. 29 Albion News Print and Electronic Editions.